Sue Quinn’s Super Foods Every Day: Recipes Using Kale, Blueberries, Chia Seeds, Cacao, and Other Ingredients that Promote Whole-Body Health includes some surprisingly good recipes. I say surprisingly because this is a small book and ‘super foods’ are a fad, so I figured it would be a quick cashing-in on the trend. Instead I found some delicious recipes. I love that the table of contents lists every recipe in the book–it makes it very easy to locate just what you want. Our favorite recipe so far is the Berry Blast Smoothie. 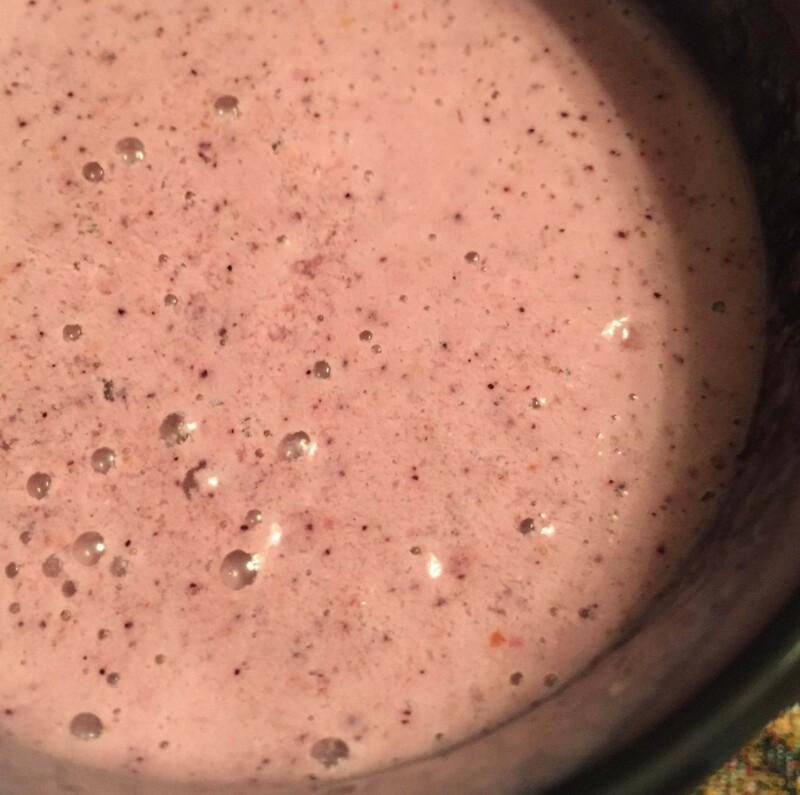 Three kinds of berries, juice, fresh ginger, chia seeds, non-dairy milk, honey, yogurt. The recipe makes one serving. On the one hand, this is great for some folks and it’s a recipe that’s easy to scale. On the other hand, it uses entirely fresh fruit, at 1/3 cup each per serving, which leaves you with a lot of spare fresh berries that might not last long enough for you to go through all of them. I hate wasting food. Luckily there are two of us making these recipes, so we went through the berries twice as fast. The taste of this smoothie is fantastic; it’s absolutely worth making. It comes out with a very light, airy, almost mousse-like texture. The book frequently lists bok choy amounts by the head. Thankfully there’s a photo of the ingredients for each recipe, because you can clearly see that they’re using heads of baby bok choy. Also, even using the baby bok choy there’s often still more greenery than makes sense for the recipes. 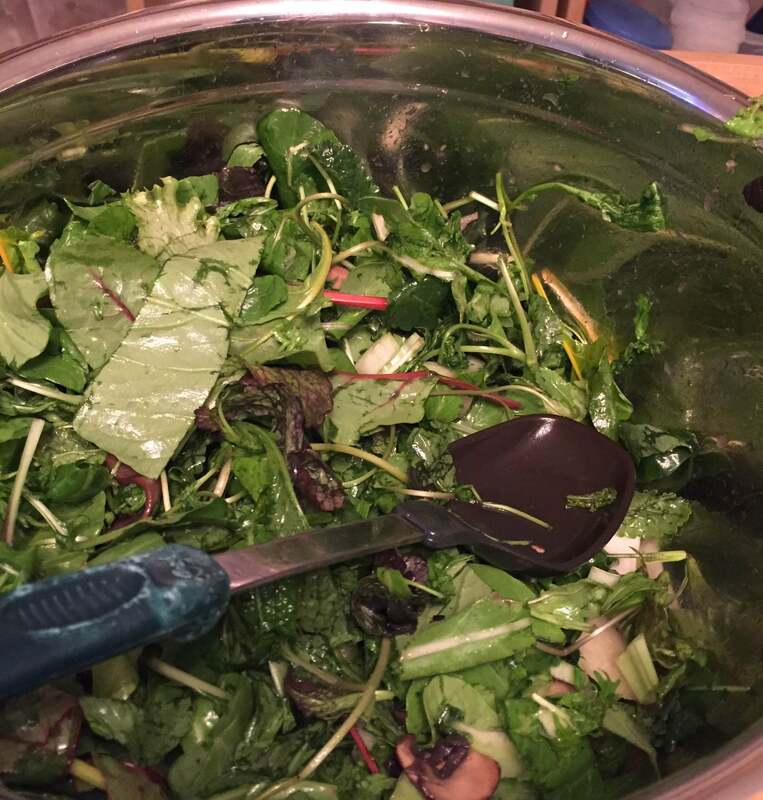 One of those recipes is the Sesame Crunch Bowl salad, which we found to be quite good. However, there’s something wrong with the recipe for that salad. It’s listed as serving one, but it includes not just one to two heads of baby bok choy, but also 20 ounces of other greens. We used well less than 20 and we still had a ginormous bowl of it. Besides the smoothie, my other favorite recipe was the Soup Soother. It’s a very simple recipe using stock, soy sauce, a little bit of seaweed, a little firm tofu, and a head of baby bok choy. Even with the baby bok choy we clearly still had more bok choy than intended, judging by the photos of the finished product. Also, it seemed more like two servings rather than the four noted. The number of servings often seems a little off. Each recipe includes a photo of the separated ingredients, and a photo of the finished product. (Great for noticing things like the bok choy discrepancy). They’re attractive photos and they certainly prove useful. Apart from some fish, many of the recipes are vegetarian. I wasn’t amazed by the book–but I did fall in love with the flavors. It helps to have some cooking experience already if you want to use this book.